In Marysville, Ohio; Georgetown, Kentucky; and Smyrna and Spring Hill, Tennessee, life will never again be the same. Once small rural communities, they're now boom towns-thanks to Honda, Toyota, Nissan, and Saturn. It's happening all over America: communities desperate for economic development lure large companies looking for a docile labor force, cheap real estate, and an alternative to the regulations of cities. But what happens to a small town when it successfully attracts corporate America (or corporate Japan)? As Michele Hoyman shows, from the announcement of plant siting until long after it opens, the town's rural lifestyle is dramatically transformed through radical changes in its politics, public administration, schools, traffic patterns, real estate values, water and sewage systems, police and fire protection, and cultural views. 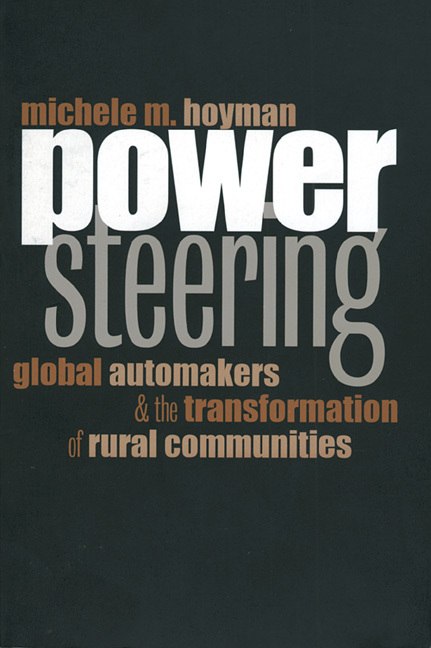 In Power Steering, Hoyman chronicles such transformations in Kentucky, Ohio, and Tennessee, shows how they emerged, and explains why they matter. She skillfully interweaves agenda-setting theory with impact analysis to demonstrate that economic development is an ongoing process with identifiable stages, not merely a final set of outcomes. Drawing upon extensive interviews with community leaders, public opinion polls, and in-depth analyses of town budgets, she creates a richly detailed study that clearly delineates the economic, social, and political impacts associated with corporate forays into the hinterlands. Providing a wealth of detail for scholars and administrators, Hoyman's study also offers a thoughtful guide for any community attempting to attract similar industries. For example, she cautions communities to avoid giving away too much in tax incentives and environmental control waivers, lest those long-term costs undermine the short-term benefits provided by the corporation. Balanced and insightful, her work provides concrete examples of how America's rural towns are using the new global economy to help shape more promising futures for themselves. Michele Hoyman is associate professor of political science and public policy administration at the University of Missouri-St. Louis and coeditor of The Informal Economy and Joint Training Programs. She is also a labor arbitrator.